Kestrel KM 401 is a smartphone that has an amazing display and impressive performance. With all the features available in a smartphone, it will surely make your tasks simpler and easy. All this for an amazing value for money making it preferable in more ways than one. Kestrel KM 401 has a compact design with a dimension of 125.8 mm Height and 63.8 mm Width. This phone is available in black and white colour handsets, both carefully chosen for a trendy look. It's beautiful 4 inch Screen, 480X800 resolution with OGS Capacitive Screen enables good display of images and videos on your phone. Kestrel KM 401 is equipped with Android 4.4 (KitKat) and dual core processor for a swift performance. Kestrel KM 401 comes with an audio jack of 3.5 mm, Bluetooth, Charging Point Micro USB charging, Internet features like E-mail, Wi-fi, GPRS, EDGE, USB Connectivity and 3G options. Share pictures, songs and videos with your friends or connect your phone to your computer to exchange files. Capture beautiful memories on this phone with it's 5 Mega pixel Rear Camera or take video using its video recorder. Additionally, it has a secondary camera and flash support for a smooth media experience. Video player which supports MP4, Music player which supports MP3 and FM radio are available on Kestrel KM 401 to keep you entertained all time. 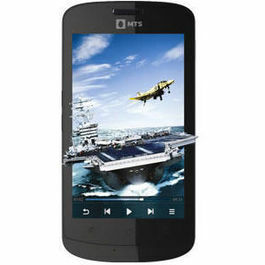 Listen to music, radio or watch a video on the move with this phone. 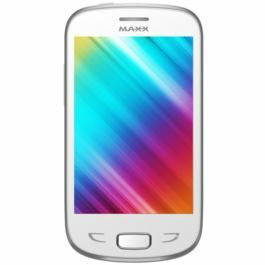 This phone has an expandable memory of up to 32 GB, 512 MB RAM and a 4 GB ROM which ensure you have ample space for your photos, videos, songs, apps, movies etc. It has a powerful 1400mAh Battery that offers standby time of up to 200 hours. Kestrel KM 401 is a smartphone that has an amazing display and impressive performance. With all the features available in a smartphone, it will surely make your tasks simpler and easy. All this for an amazing value for money making it preferable in more ways than one.Design & Display Kestrel KM 401 has a compact design with a dimension of 125.8 mm Height and 63.8 mm Width. This phone is available in black and white colour handsets, both carefully chosen for a trendy look. 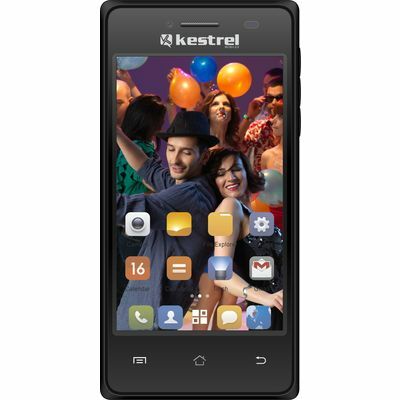 It's beautiful 4 inch Screen, 480X800 resolution with OGS Capacitive Screen enables good display of images and videos on your phone.OS and ProcessorKestrel KM 401 is equipped with Android 4.4 (KitKat) and dual core processor for a swift performance.ConnectivityKestrel KM 401 comes with an audio jack of 3.5 mm, Bluetooth, Charging Point Micro USB charging, Internet features like E-mail, Wi-fi, GPRS, EDGE, USB Connectivity and 3G options. Share pictures, songs and videos with your friends or connect your phone to your computer to exchange files.Camera Capture beautiful memories on this phone with it's 5 Mega pixel Rear Camera or take video using its video recorder. Additionally, it has a secondary camera and flash support for a smooth media experience.MultimediaVideo player which supports MP4, Music player which supports MP3 and FM radio are available on Kestrel KM 401 to keep you entertained all time. Listen to music, radio or watch a video on the move with this phone.Storage and BatteryThis phone has an expandable memory of up to 32 GB, 512 MB RAM and a 4 GB ROM which ensure you have ample space for your photos, videos, songs, apps, movies etc. It has a powerful 1400mAh Battery that offers standby time of up to 200 hours.